Metal Gear Survive, the bizarre zombie horde survival game that really has nothing to do with Metal Gear, kicked off an open beta yesterday. It’s surprisingly fun to play but lacks the heart and quirkiness that drew people to the series to begin with. After Metal Gear Solid V: The Phantom Pain, Konami took a break from making pachinko machines to develop a nonsensical Metal Gear game about scavenging supplies and fending off untold numbers of nanotech zombies. There’s no stealth and pretty much nothing connecting it to previous games. 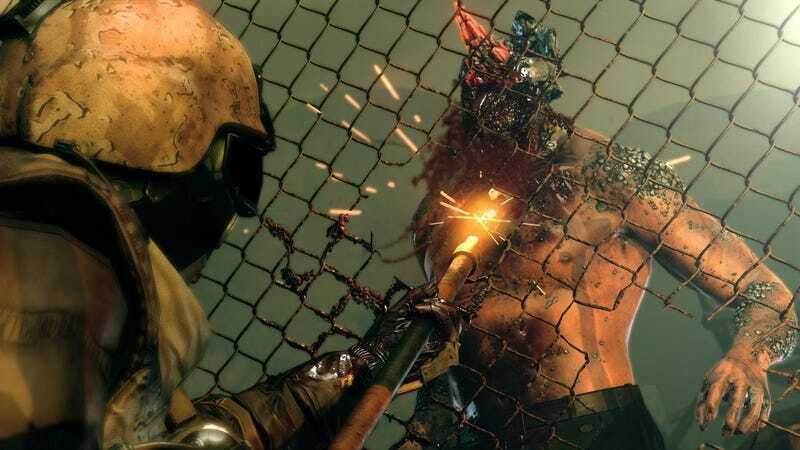 Metal Gear Survive drops players into the shoes of a commando in an alternate dimension full of headless nightmare creatures. They must gather resources and protect key locations by building defenses and fighting off waves of enemies. The challenge is more fun than it sounds but Metal Gear Survive’s presentation is a crash course in cold, corporate design. After selecting weapons and additional items like medkits, players are tossed into a wasteland and must start building up an impromptu series of defenses around a central base. The goal is to protect a small generator that is extracting resources. The opening minutes of most matches will be spent running around to gather materials such as iron and wood in order to craft fences, barricades, and traps that with help your team last against tons of zombies. Scrambling around to break down boxes before rushing to a crafting bench has an enjoyable sense of urgency. Crafting is highly streamlined; if you have the materials, all you have to do is go to a workbench and select what you want to make. Chain link fences have openings that allow you to shoot or stab zombies while spiked barricades are good for trapping monsters who run into them. It only takes a few moments to select your defenses and build them. The process is snappy and fast. Chaos erupts when the zombies arrive and while it doesn’t feel like Metal Gear’s normal stealth fair, taking down monsters alongside teammates feels rewarding in its own right. Survive lifts most of its gameplay from The Phantom Pain, which already boasted solid core mechanics. Guns are easy to aim and have a strong punch to them when fired and while melee combat can feel slightly stiff, enemies respond with a satisfying friction, machetes and spears grinding against their metallic skin. Each match ties into an engrossing loop of resource acquisition, crafting, and combat. Every round rewards new schematics and a pile of supplies that can then be used to create new weapons and traps for the next match. Successful outings help players develop a wider arsenal that allows them to fight off tougher enemies and craft more complex bases. The entire affair suffers from a strange and clinical presentation. One of the most curious things about Metal Gear Survive is how clean it is. It’s really apparent in the time between matches, where players wander a white void where they can manage equipment and sort through a tangled web of skill trees and crafting menus. While functional, the end result is a lack of charm. Shifting from match to match and slipping from one white void to the next is dreary, as if the world of Metal Gear and all the associated soul has been vacuumed up. Therein rests Metal Gear Survive’s greatest problem. While the moment to moment gameplay is exciting, it stills feels like a stitched together chimera of ideas that never really combine into anything unique. Survive’s gunplay and building are well implemented but there’s a lack of ambition that’s off-putting. Enemy designs feel like a greatest hits of well worn archetypes: fast minion zombies, fat exploding zombies, heavily armored elite zombies. Survive suffers from an unoriginality that’s jarring given the series’ pedigree. It’s a glorified horde mode with branding, divorced from any of the quirky humor or considered encounter design that set Metal Gear apart from the pack. There’s no dialog between characters to spice things up and no larger metagame akin to The Phantom Pain’s complex and thematically dire base management. Metal Gear Survive is one of the strangest games I have ever played. It is the definition of competent, with a mixture of combat and management that is rewarding in short bursts. But it lacks any larger aspirations other than mindless zombie bashing. It marks a paradigm shift for the series, grinding down edges and ironing out oddities into something safe. Slicing through zombies can be fun but there’s no shaking the feeling that something unique and strange has been lost forever.